Before we left Spokane to head to Seattle, we met the kiddos for some breakfast. The kiddos said they liked this restaurant called Old European and it was right near our hotel. Jake and I both got “lighter” plates [$7.25 – comes with choice of meat, egg, and one “side”]. 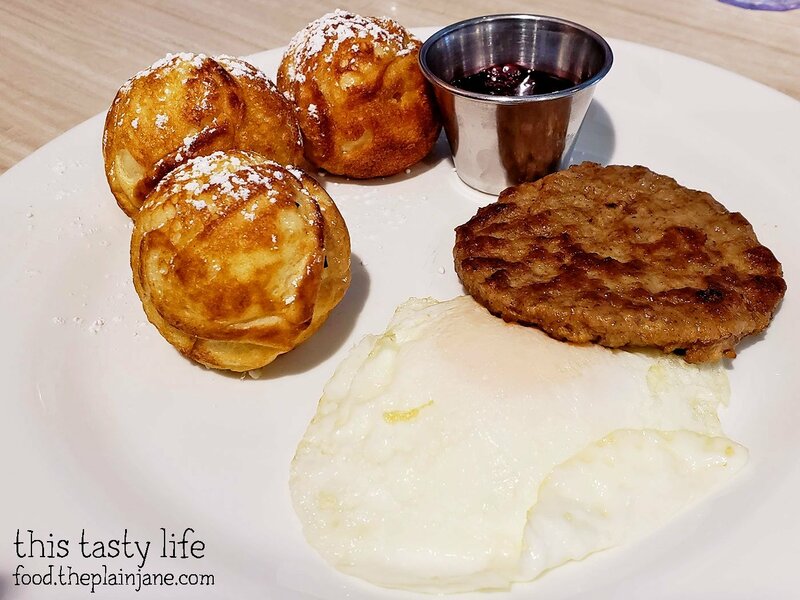 For his side, Jake got the Danish Aebelskivers which are kind of like puffy pancake balls. They are topped with a little bit of powdered sugar plus a side of fresh jam (I think it was huckleberry, maybe?). They have different flavors but Jake went with the original. I had a bite and it had a nice light, airy taste to it that was nice with the jam. I got a same lighter plate and my side of choice was the German Potato Pancake. 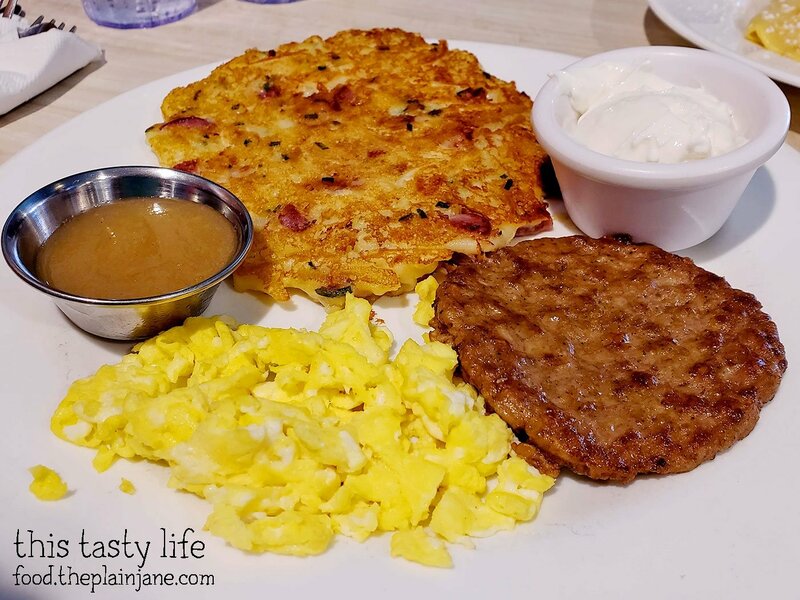 The potato pancake is made up of shredded potatoes with bits of German sausage inside. One potato pancake was quite large! It had a bit of a crisp exterior and was fluffy inside. I like the bits of sausage mixed in with the potato. 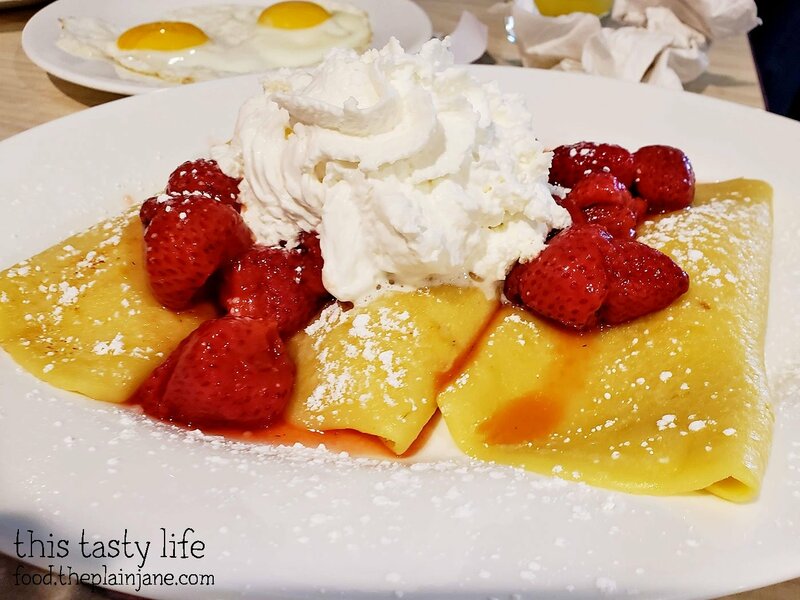 S got the strawberry crepes. He’s a teenager, he can still eat that kind of stuff for breakfast. I didn’t get a photo of A’s breakfast or her boyfriend’s breakfast. We had a nice time with the kiddos that morning before saying our goodbyes and hitting the road for Seattle. We stopped for gas and I picked up a couple of road snacks. Mostly I was excited about the Cheez-Its because it had “Baby Swiss” in the mix! 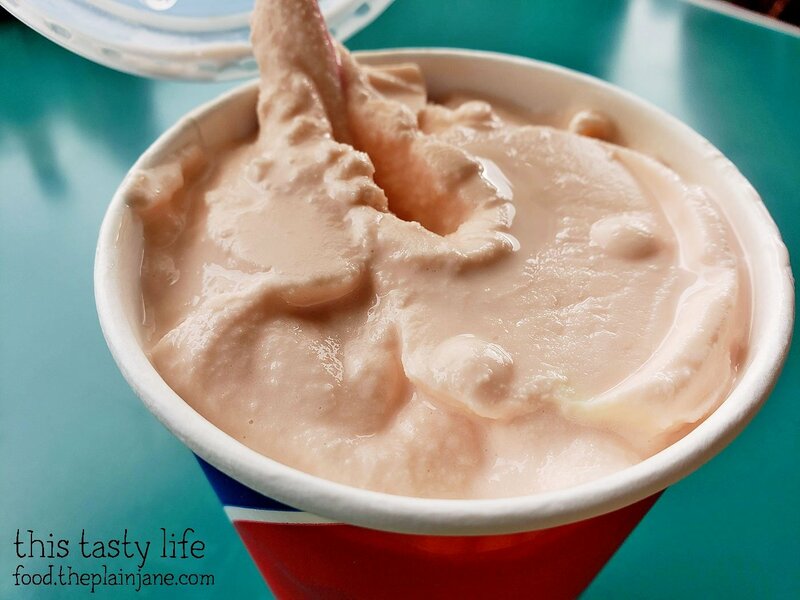 Baby Swiss is a discontinued flavor that I discovered a few months ago that I LOVE. I never find it anywhere so I was happy to see it in a mix bag! 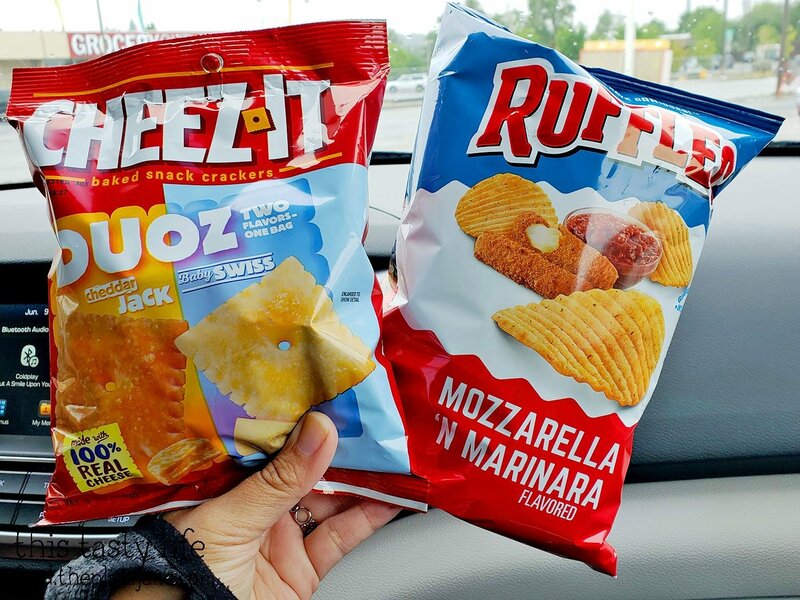 The mozzarella and marinara chips tasted like you were eating mozzarella sticks. It was kind of trippy. 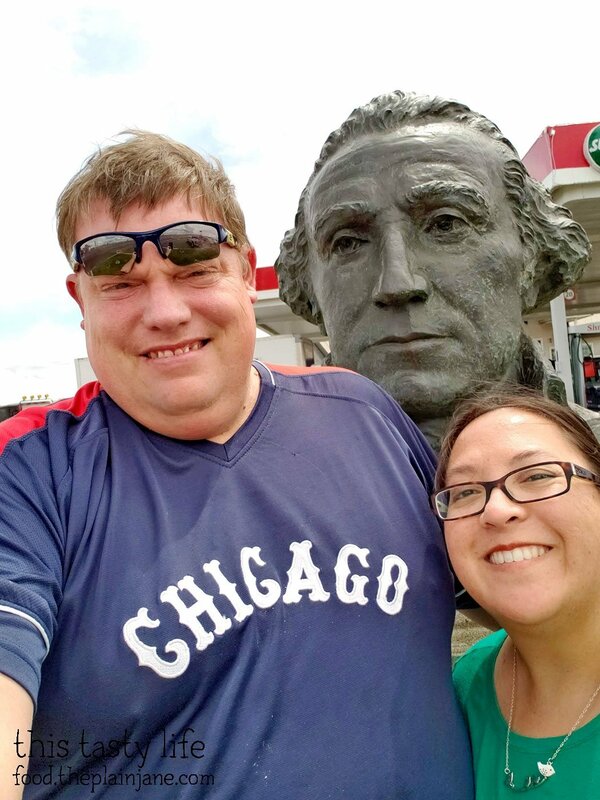 At some point on the road, we stopped at a rest stop for a bathroom break. The local American Legion was offering snacks for a donation. 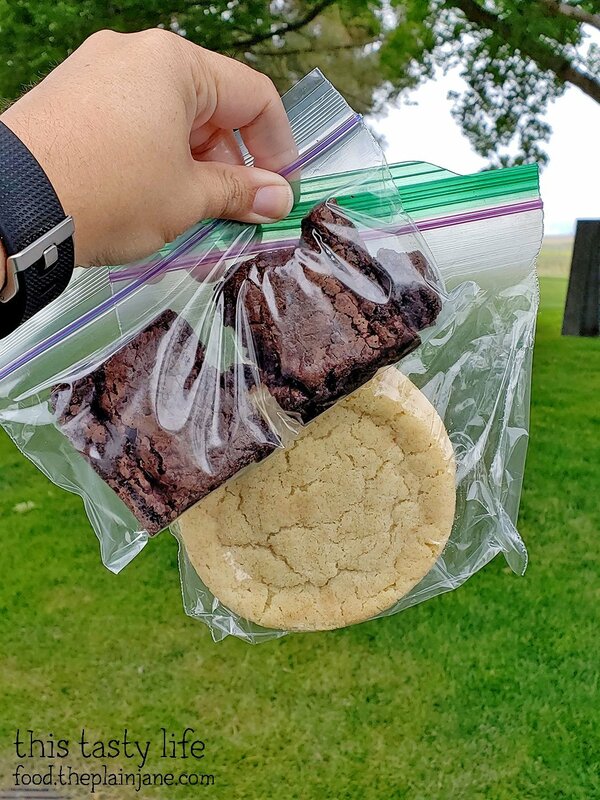 We got some cookies and brownies for the road, too. They were yummy. 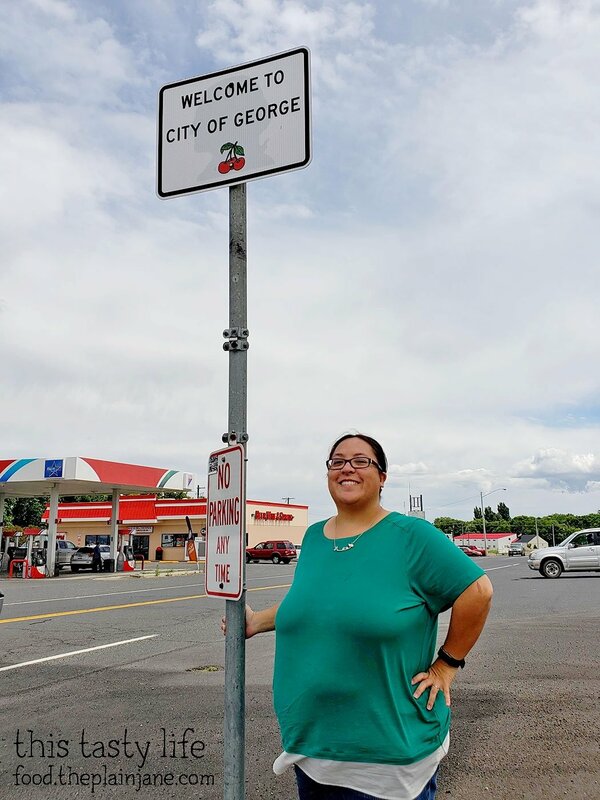 George, Washington is a very small town. The population is about 500 people. 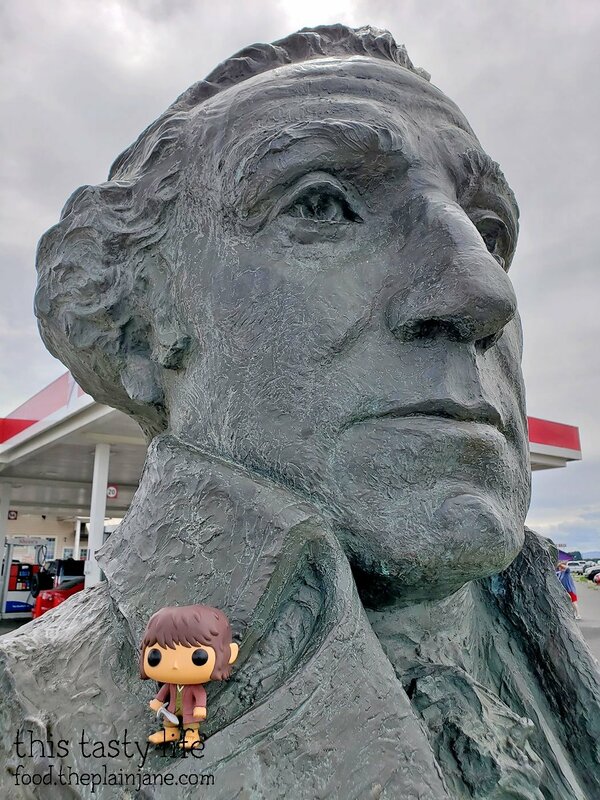 At the gas station right off the highway there’s a big bust of George Washington. We drove through the whole town. It didn’t take long. 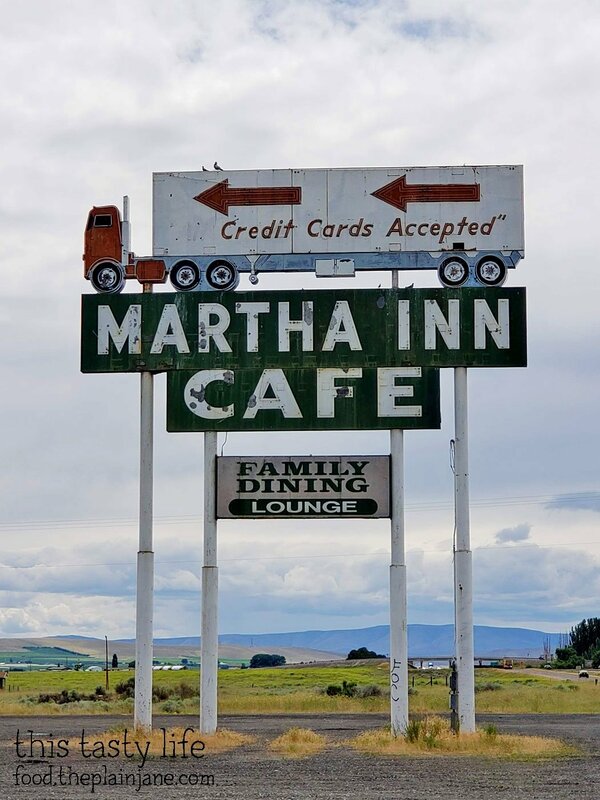 There was this sign for the Martha Inn Cafe that no longer exists. This was a small shopping area with the Colonial Market. To the right (not shown) was a place called the Cherry Pit Pub. 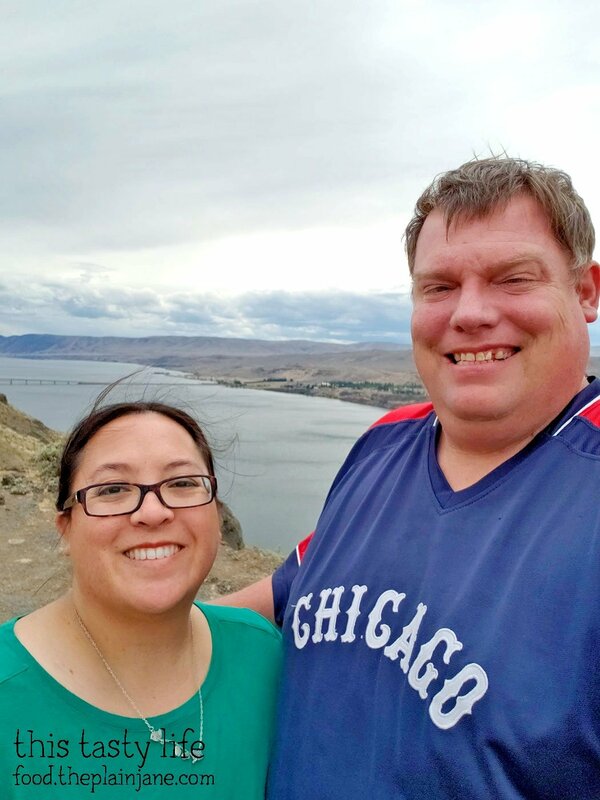 Another stop along the way was at a lookout above the Columbia River. 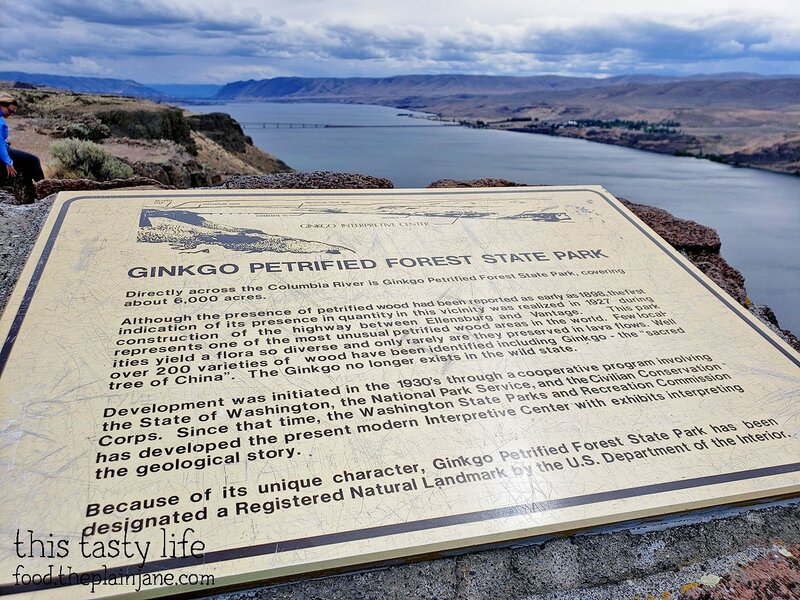 We crossed the river and went into the Ginkgo Petrified Forest State Park. 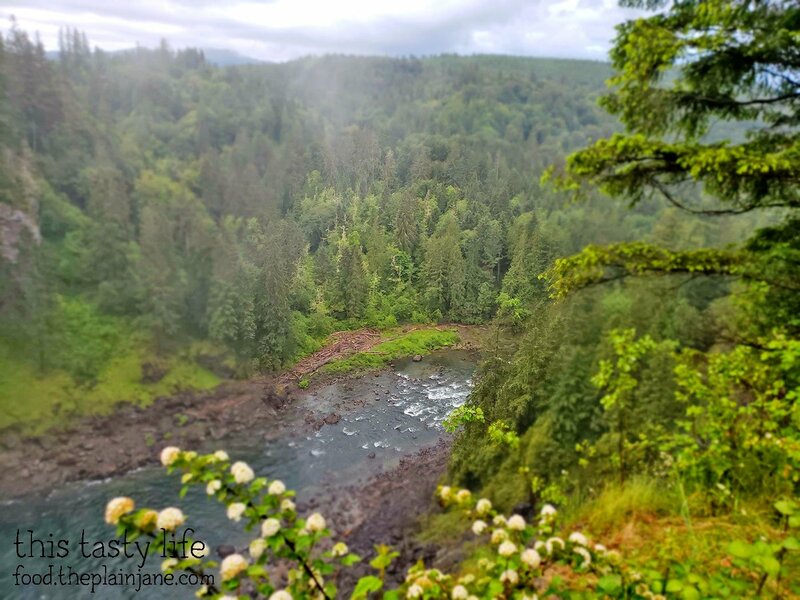 The day that we went, it was “National Get Outdoors Day” which meant that the state parks in Washington were free and we did not have to buy the $10 day pass. 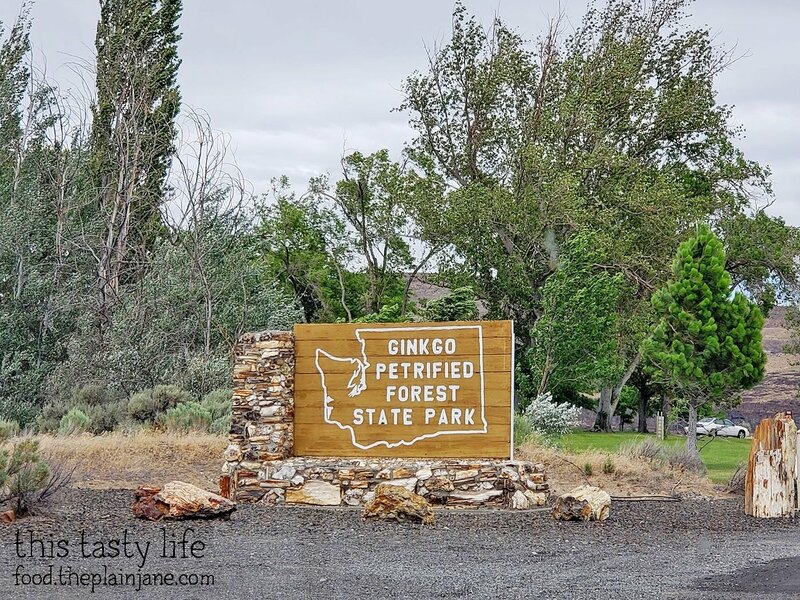 At the Ginkgo Petrified Forest they have a little museum displaying different types of petrified wood. Right outside there are a bunch on display as well. 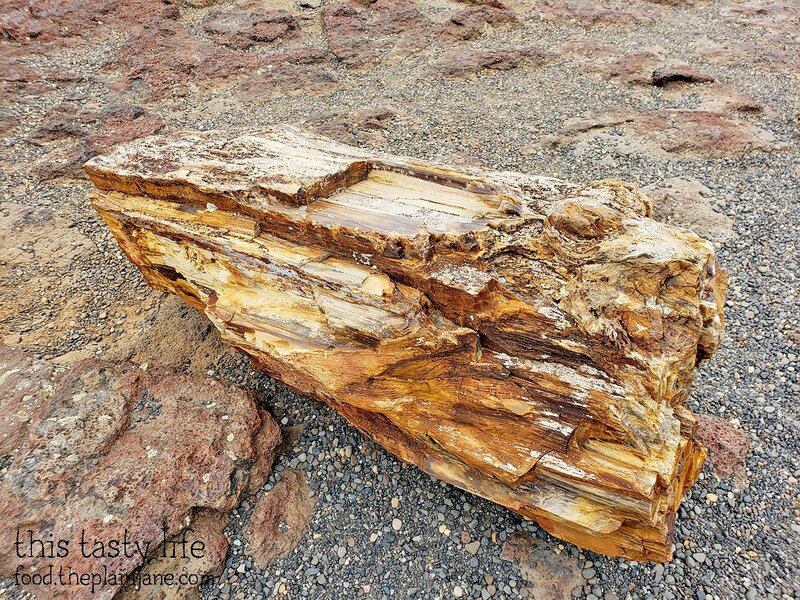 Crazy that this is a stone, right?! 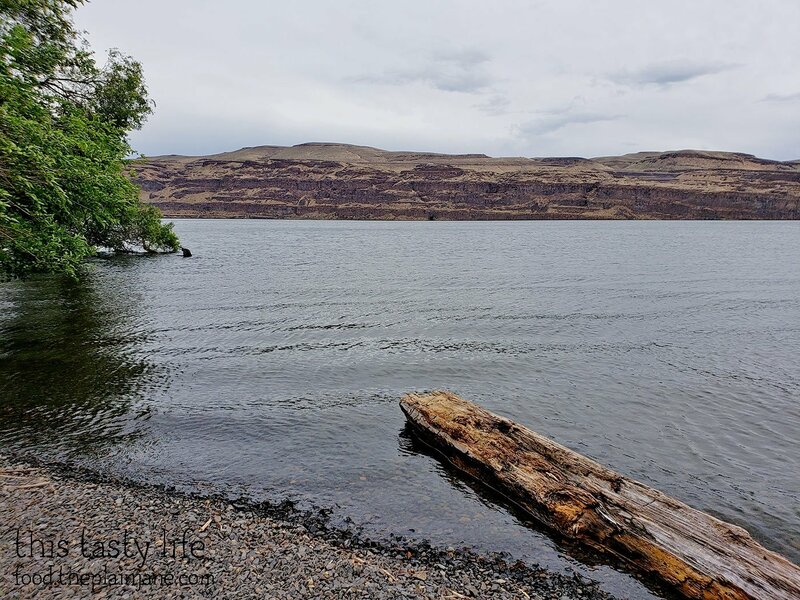 We drove down near the water’s edge. Jake likes to stick his feet in every body of water we find. I refrain from this. I don’t like taking my shoes on and off and getting wet and not having a towel and… yeah, that kind of thing bothers me. What can I say? 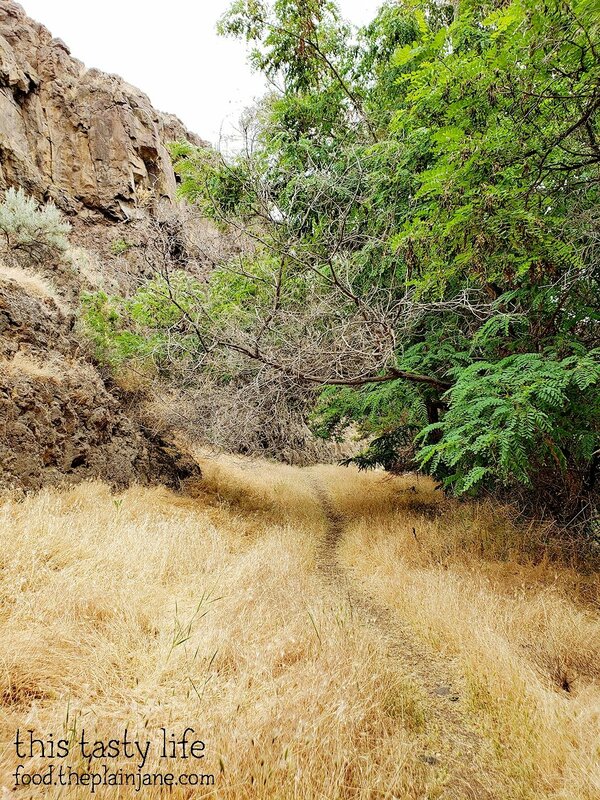 While Jake got his feet wet, I spied a little trail. I walked down it a little ways. 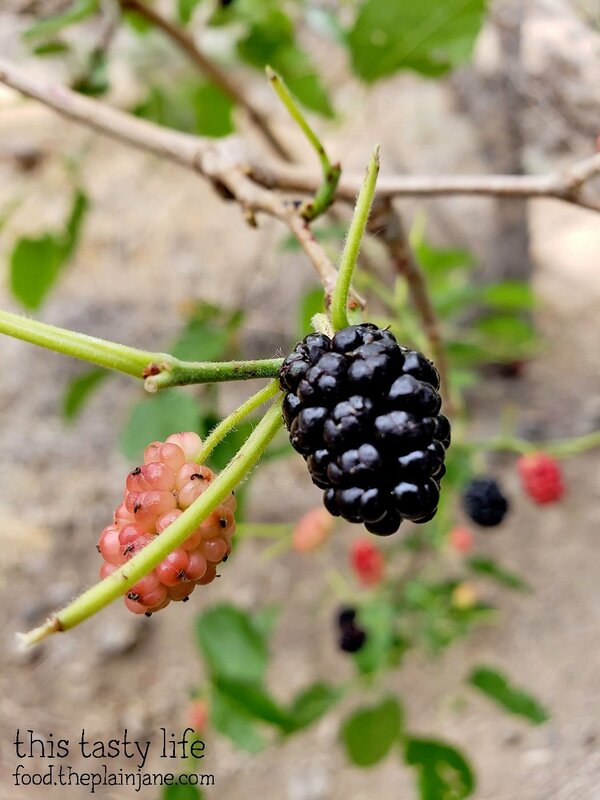 We found a wild mulberry tree growing right off of that little path and might have eaten a ripe berry or two. 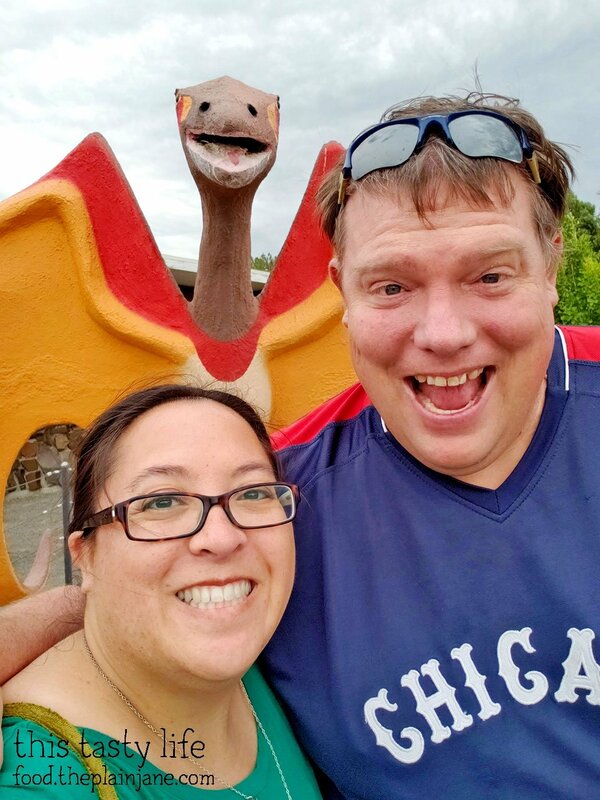 Before we left, we stopped at the Gem Shop. 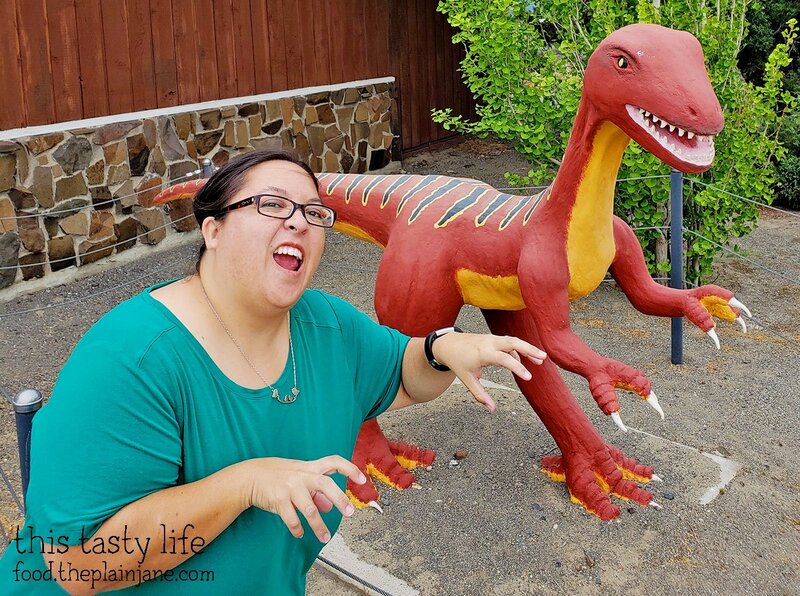 There were this dinosaurs right outside the gem shop. 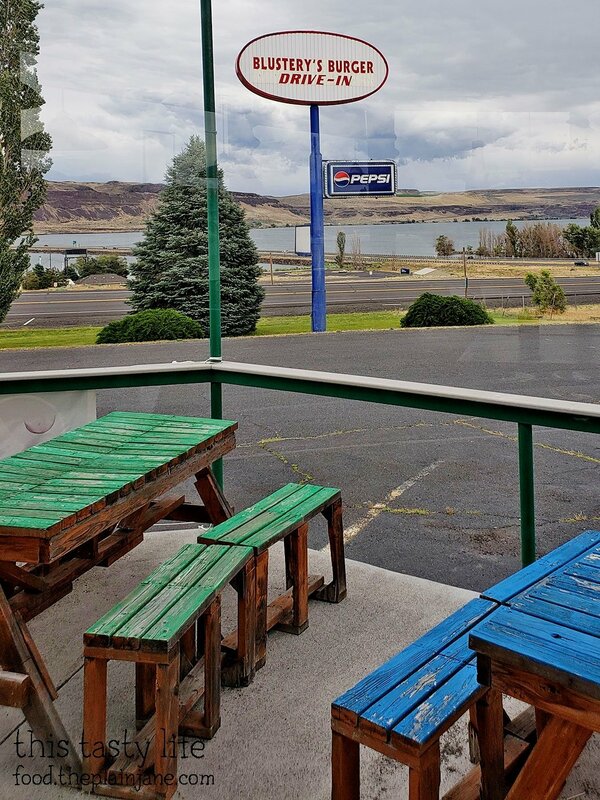 Right down the road from the entrance to the state park was a place we stopped at for lunch because I was starting to get HANGRY. Also it seemed like the only restaurant around so it was kind of the default choice. I needed to eat! 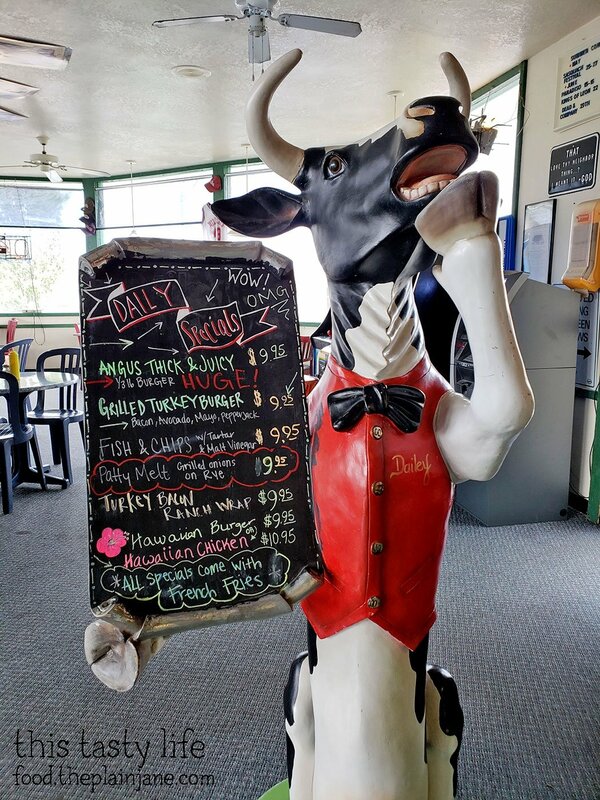 Dailey the Cow with the Daily Specials (heh heh, I see what they did there). They had… a lot of random decor on the walls and ceiling. I guess you could call it all Americana? It make me think of a kitschier version of TGI Friday’s. 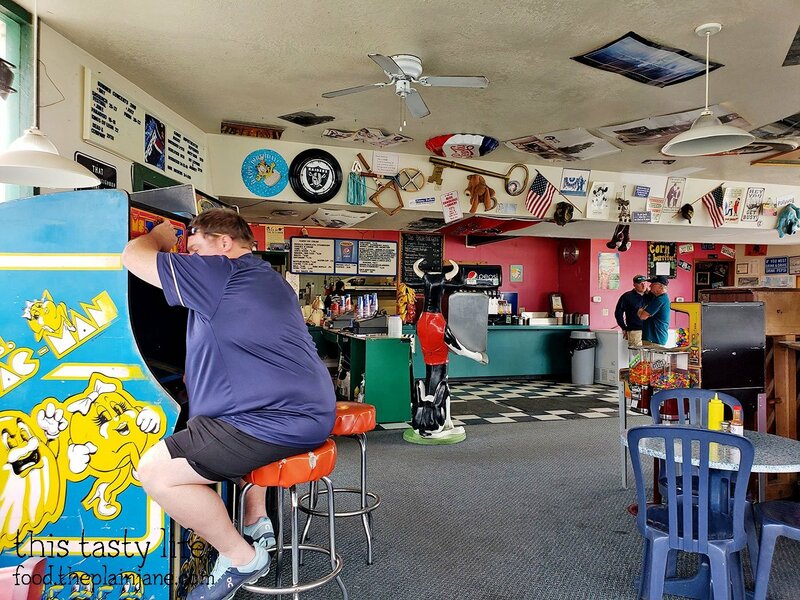 Jake is playing Miss Pac-Man because whenever he sees one, he has to go and beat the high score (if possible). Jake got this Huckleberry Shake [$5.25]. It was super duper holy balls thick. It was okay. Need more huckleberry. 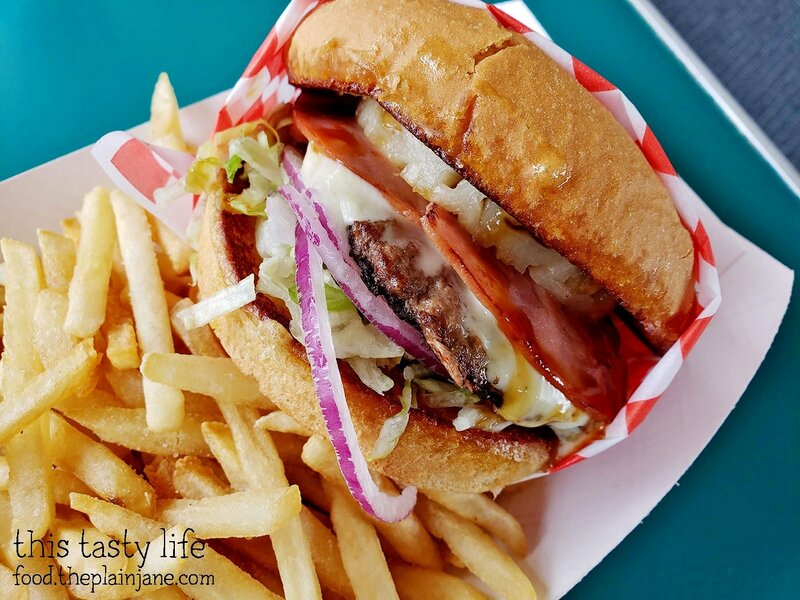 Jake got one of Dailey the Cow’s specials – the Hawaiian Burger [$9.95]. It had ham and pineapple on it. 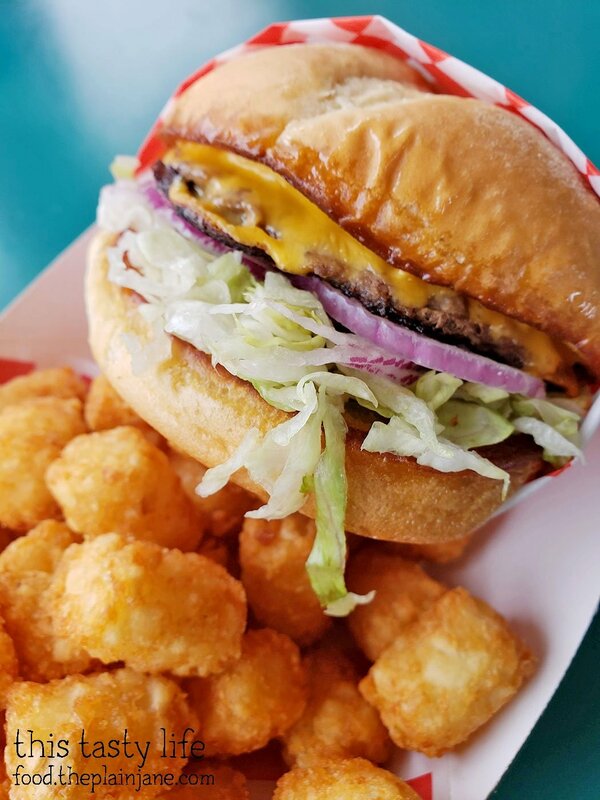 I got a cheesy-burger with tater tots. It made me less hangry and that’s all that matters. Plus tater tots = LOVE. 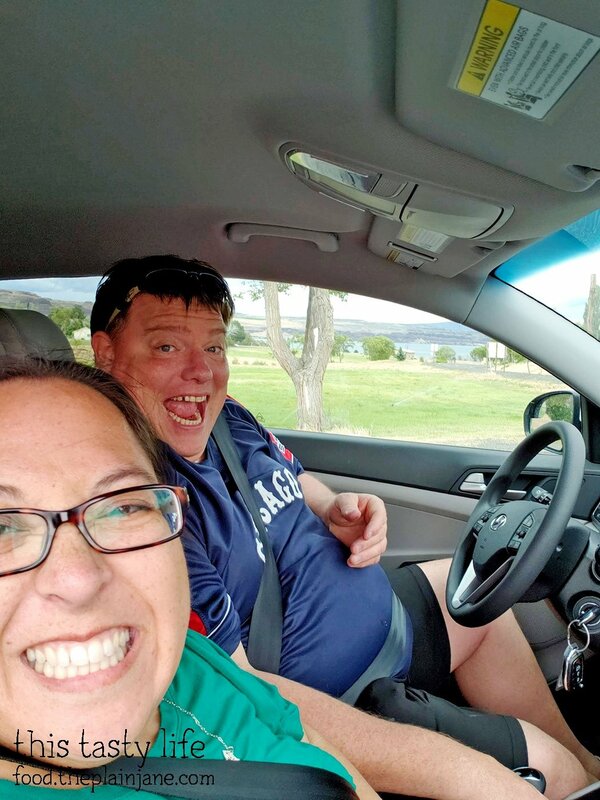 And… back on the road! Hey look, we’re not in Palm Springs! 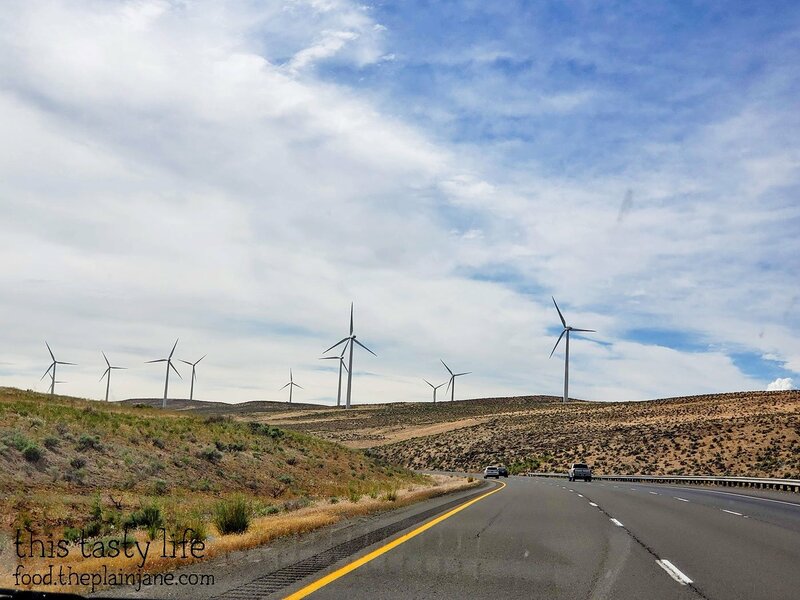 We’re in Eastern Washington and there are windmills! 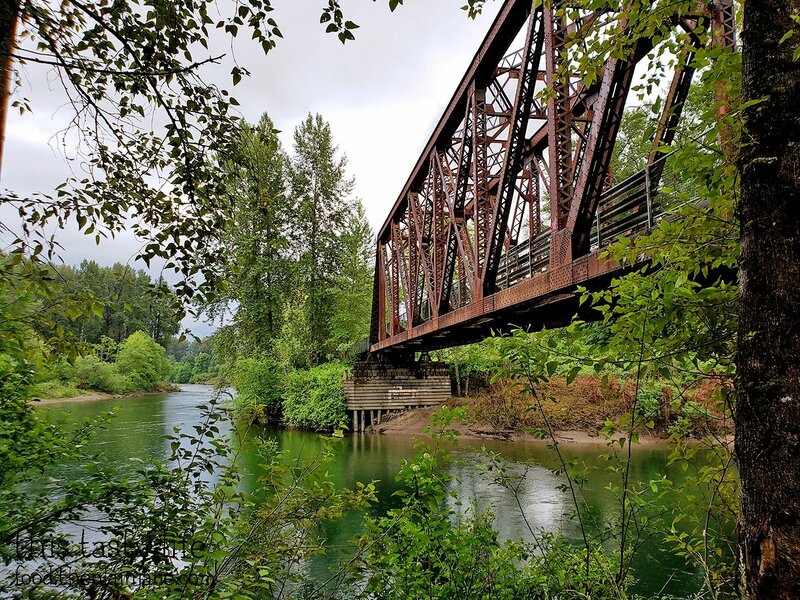 Further on…. 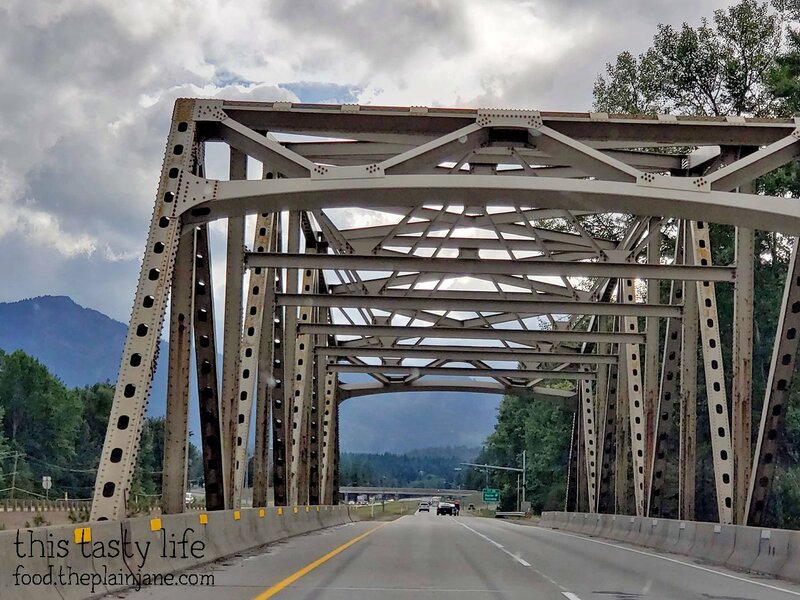 bridges and mountains! 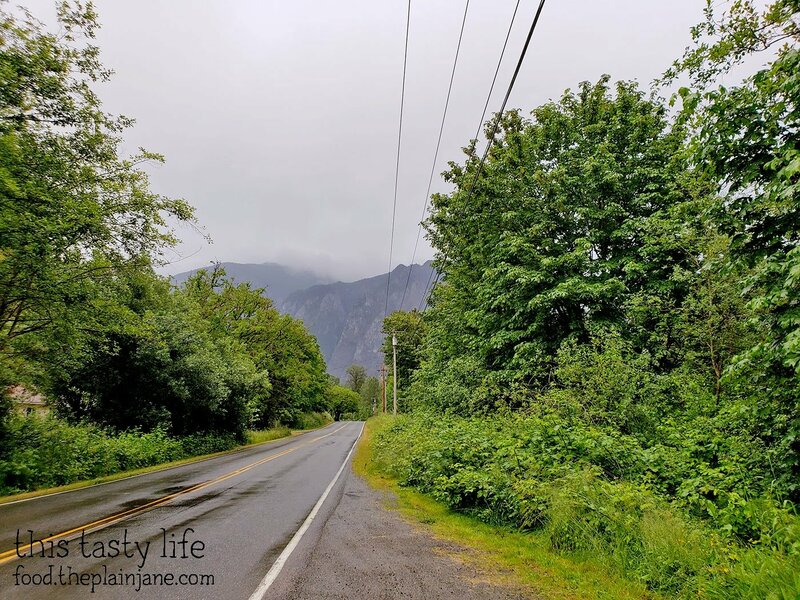 And we drove through a rainstorm! 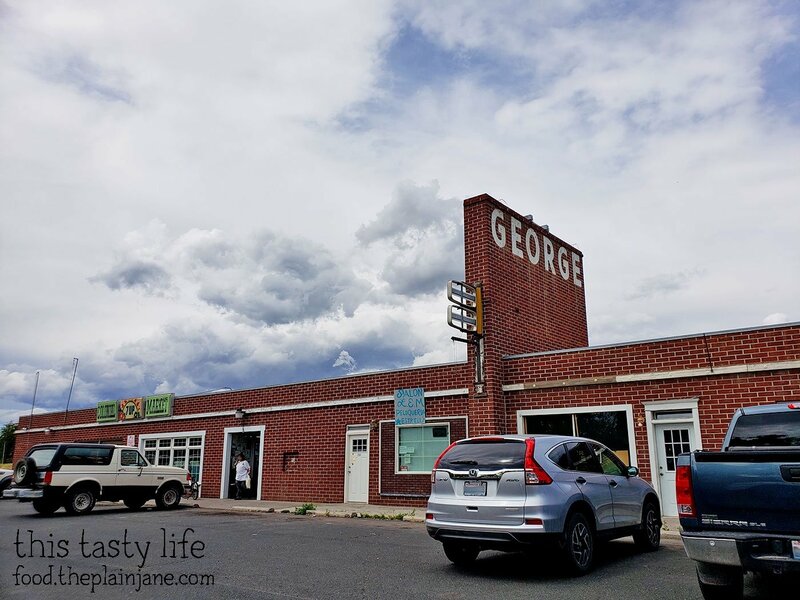 We passed through a few more towns and also stopped at the Thorp Fruit Antique Mall. 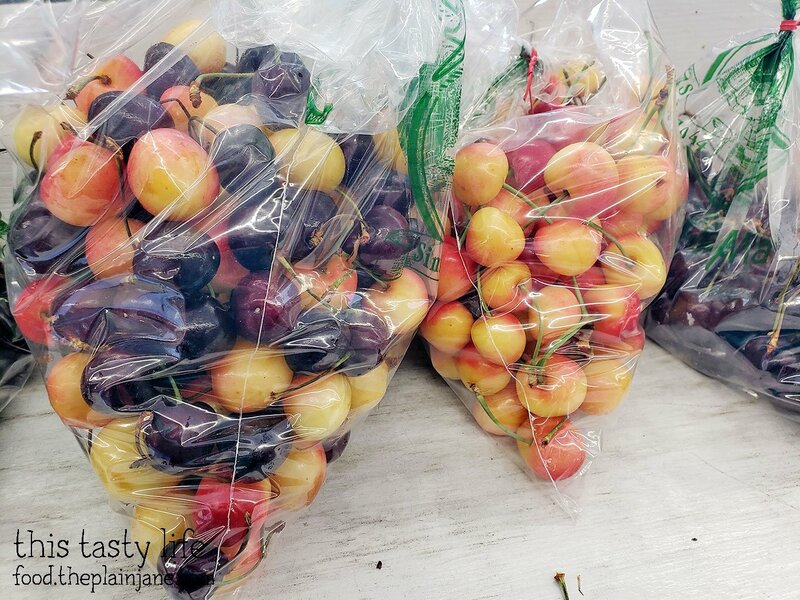 These were labeled as “Strawberry Rainier” cherries. 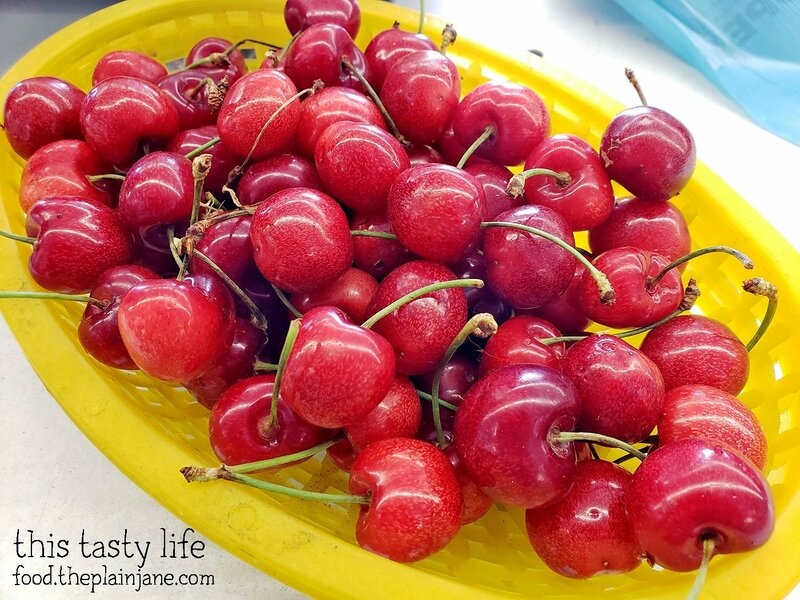 They were just the all red rainier cherries cherry picked (heh) out of the bunch. 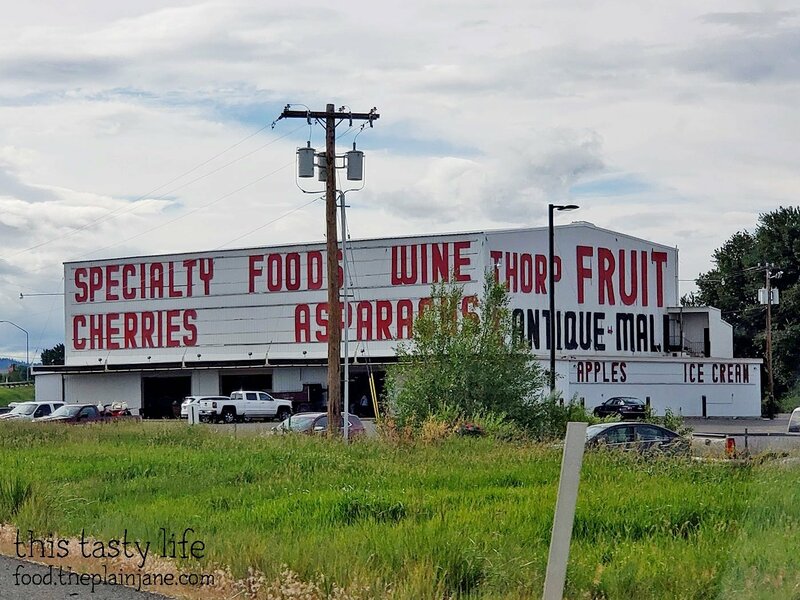 I wasn’t impressed with the Thorpe Fruit Mall. The upstairs was all antiques and the bottom was all overpriced jars of jams and other food products that didn’t seem local to the area. 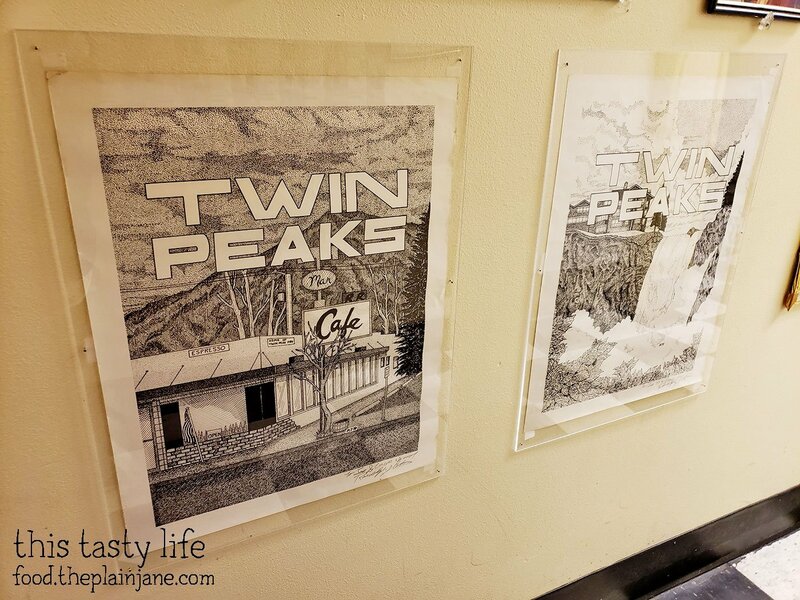 One spot I definitely wanted to check out was right outside of Seattle and where they did some filming of Twin Peaks. 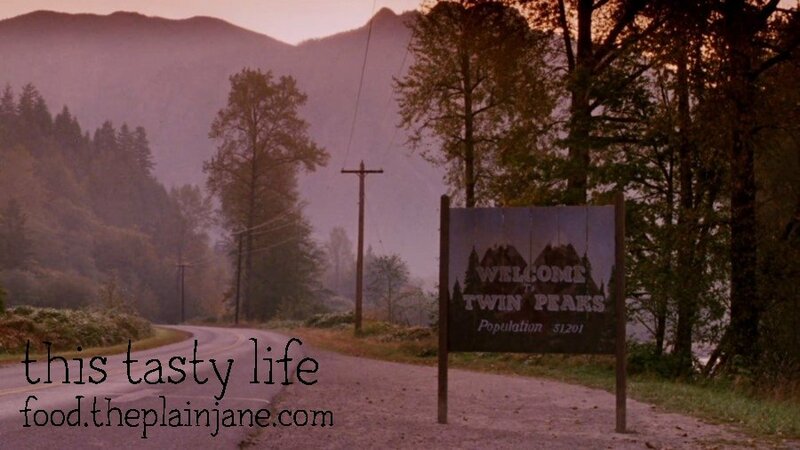 I remember back in high school I discovered Twin Peaks from an all day marathon they were running on TV. I sat and watched 8 episodes in a row. I didn’t have a lot to do when I was a teenager, I guess. 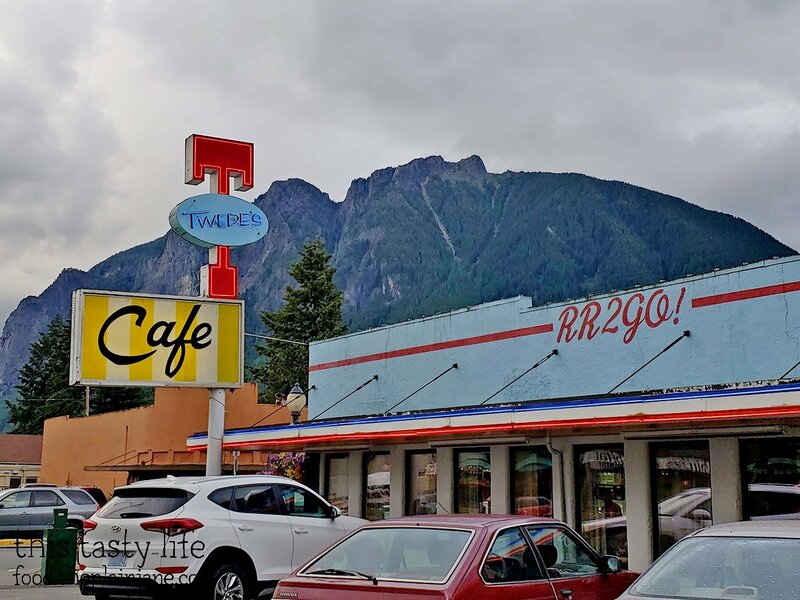 In Twin Peaks this is known as the Double R Diner. 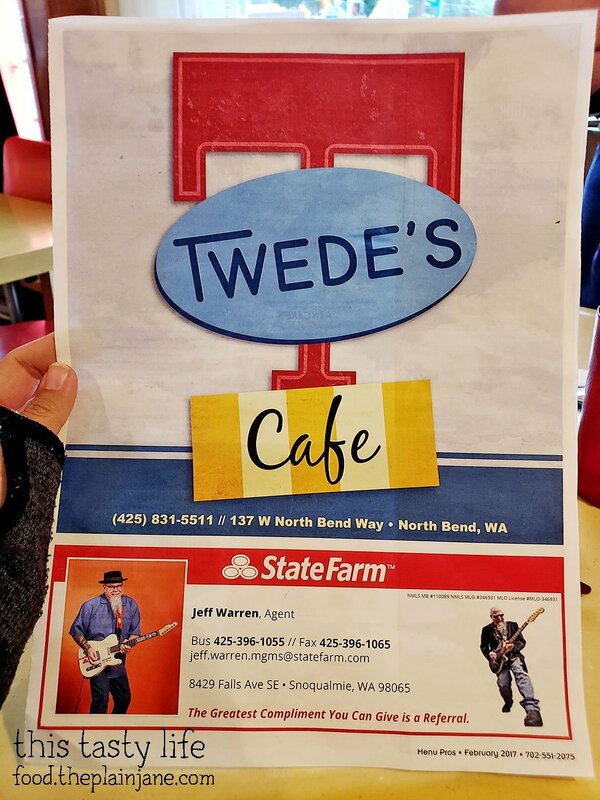 In real life, it’s Twede’s Cafe. 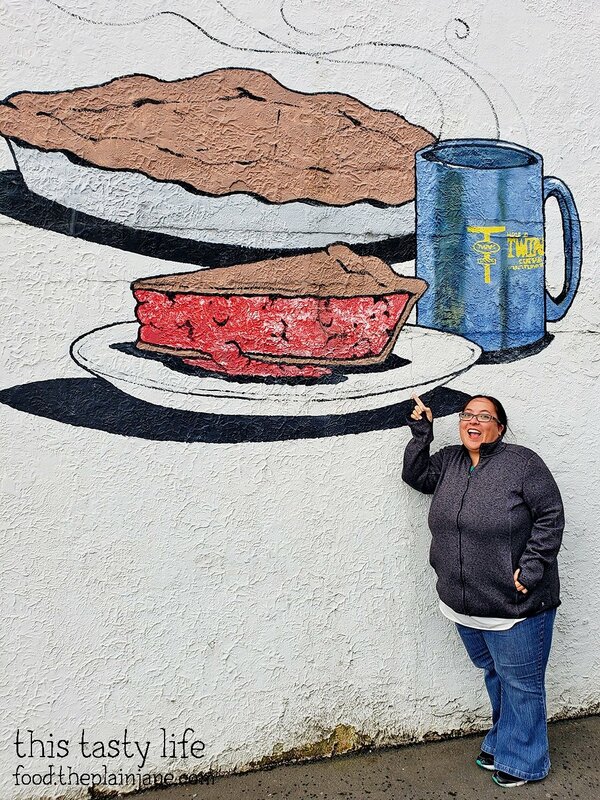 I was here for some pie! 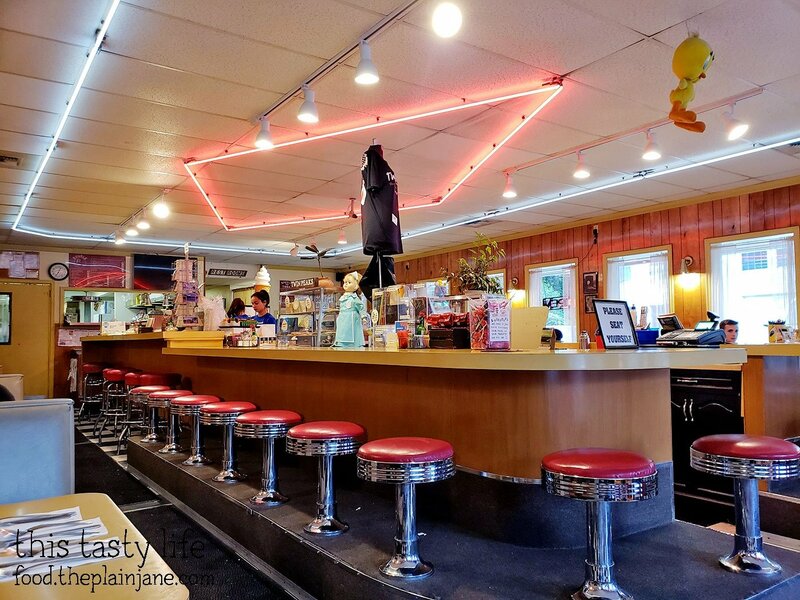 They recreated the inside of the diner to look the same as it does on Twin Peaks with the horseshoe counter top. 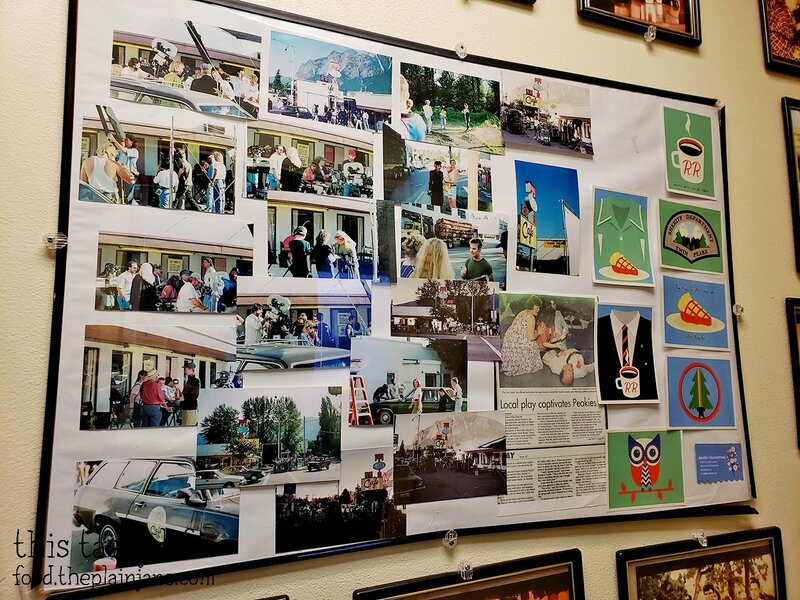 On the menu they give you a little history of the Double R Diner. 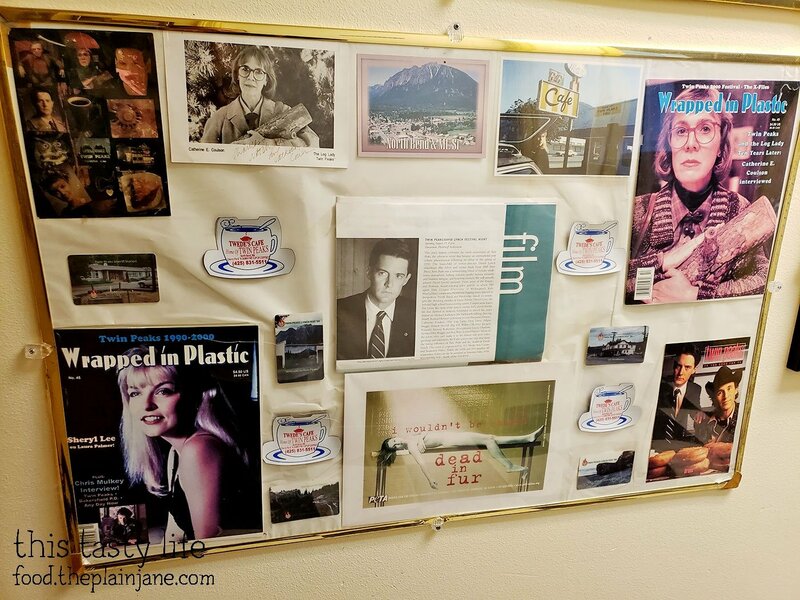 If you wander to the back, there’s a ton of Twin Peaks memorabilia on the walls plus some photos of when they filmed scenes here. 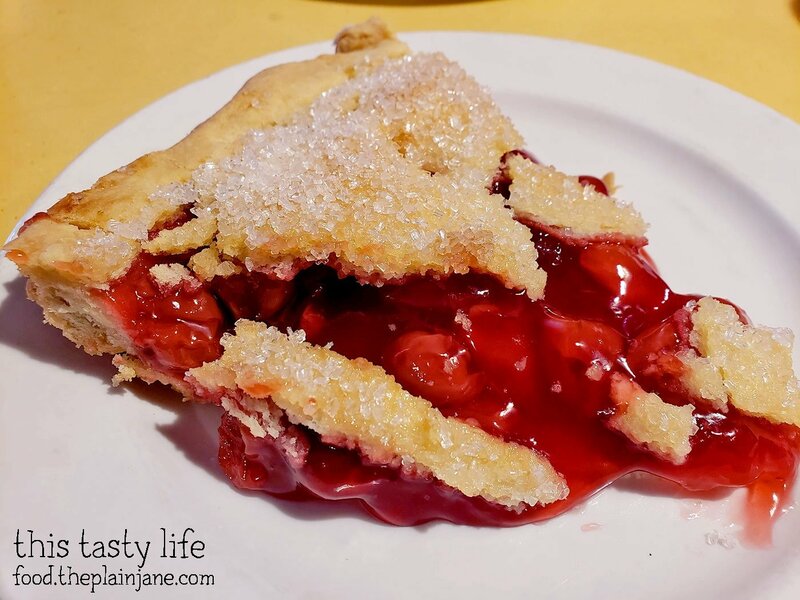 We ordered the cherry pie, of course. I failed to specify that we only needed ONE slice so we ended up getting two slices. That was fine though, I managed to easily finish my slice. It was a pretty good slice of pie. I didn’t get the damn fine cup of coffee though. It was late in the evening already and I wanted to be able to sleep that night. 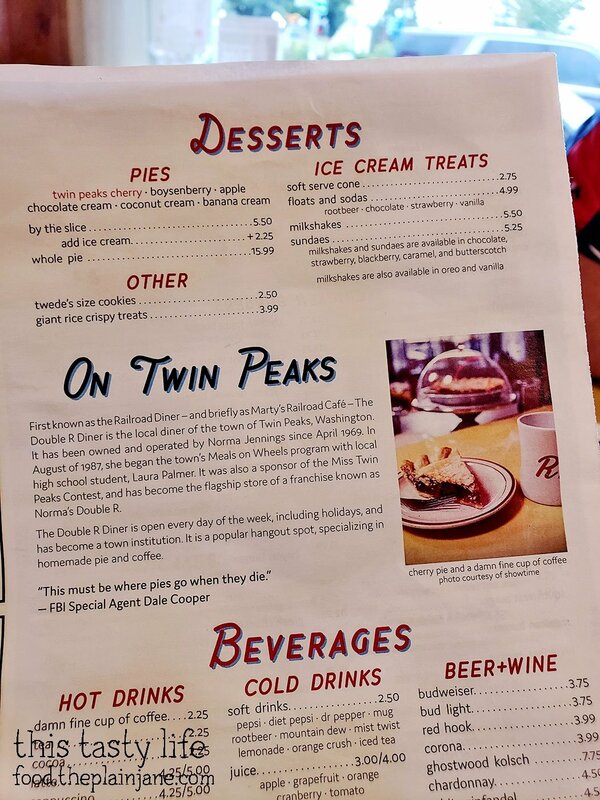 They used to have the “Welcome to Twin Peaks” sign up on the side of the road near the diner, but it was taken down for repairs. I don’t think this is the EXACT spot where the sign was, but it’s pretty darn close. Sorry, I didn’t mean to put my watermark on this. But there is the original from the show. This little bit of foliage was to the right of where the sign would have been. 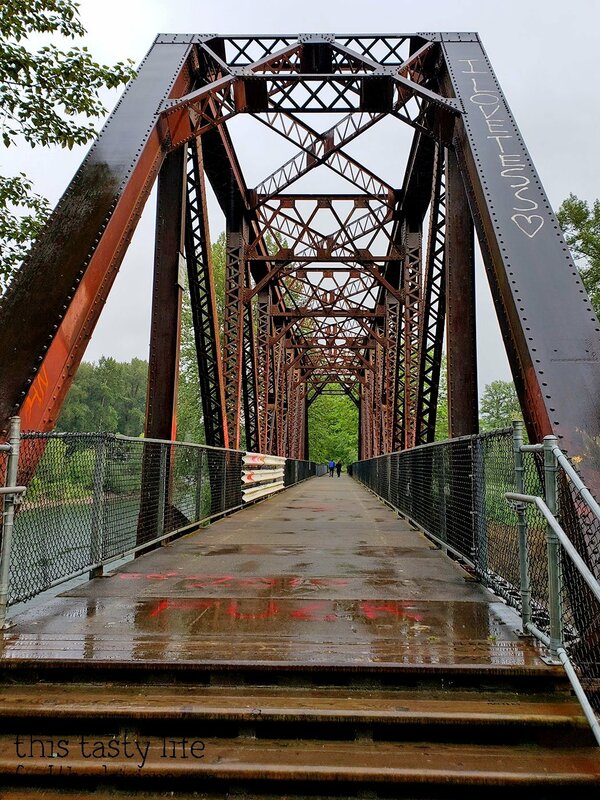 In this area we also saw this awesome footbridge and decided we had to walk over it. It was drizzling a little and it was quiet and very peaceful. 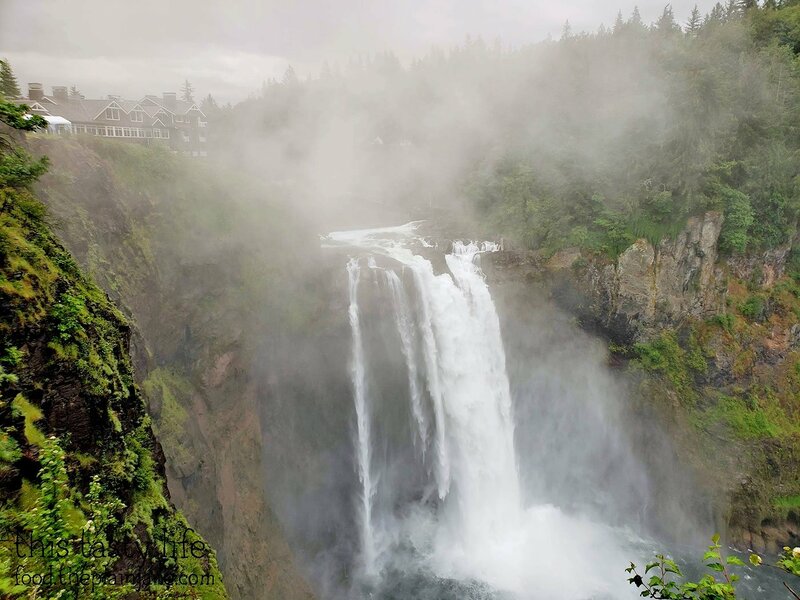 The Snoqualmie Falls, which is also featured in the opening credits of Twin Peaks, is not far from here. 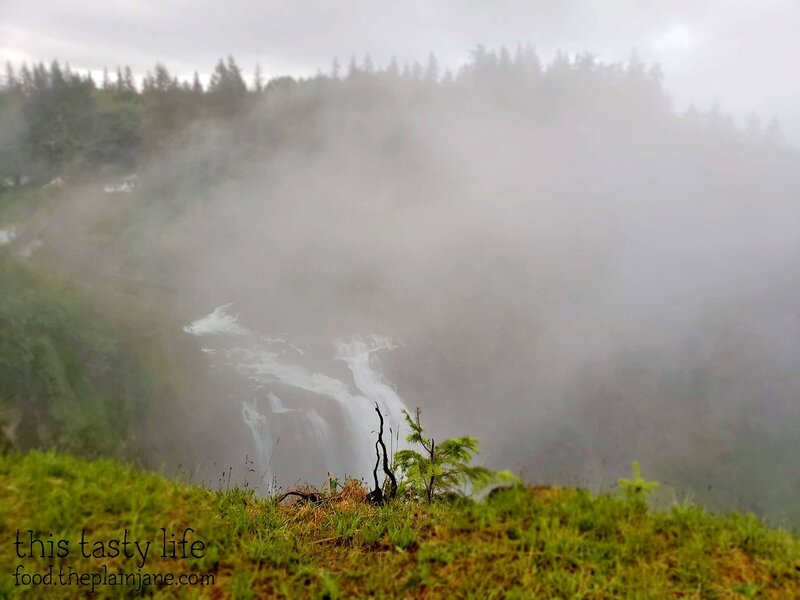 We made our way over there a little before dusk and we able to snap a few photos of the falls. 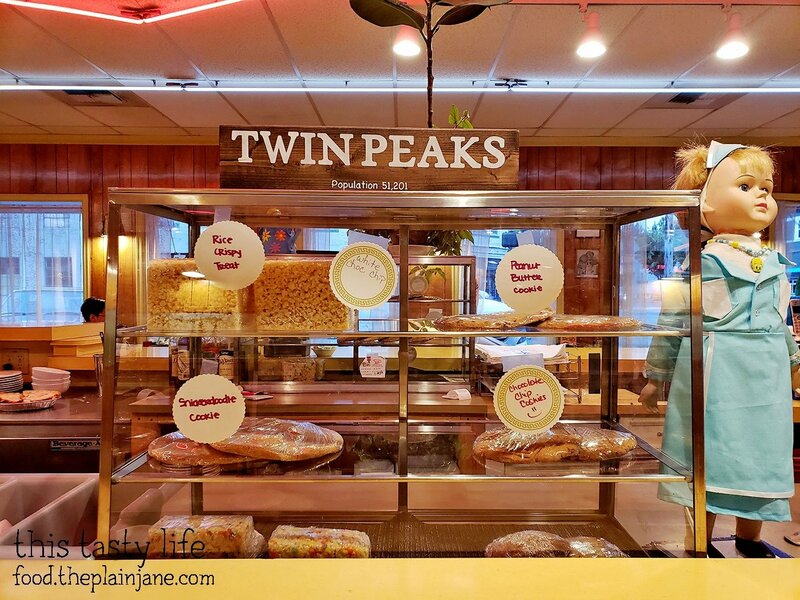 Can you hear the Twin Peaks song in your head? Down the bend past the falls. It got a little misty up here. 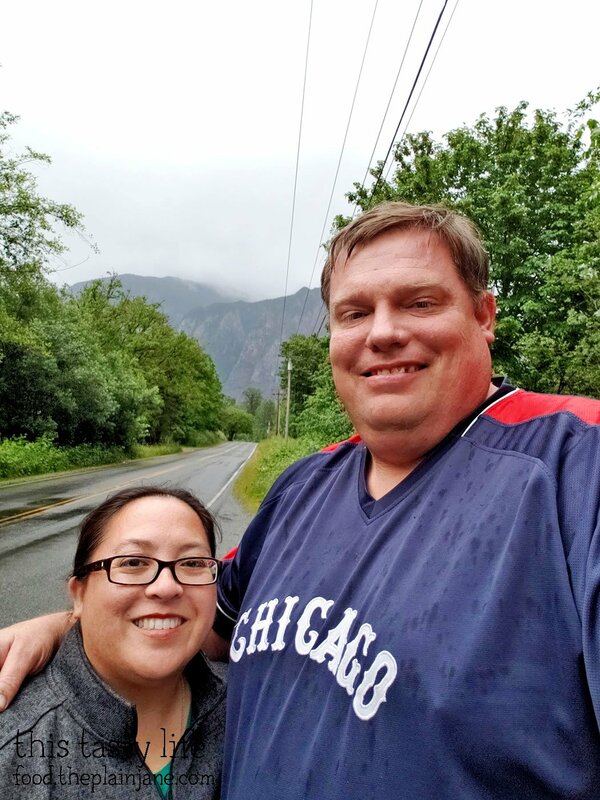 After visiting the falls, we finally made our way into Seattle and grabbed dinner and checked into our Airbnb. More on that in my next post! 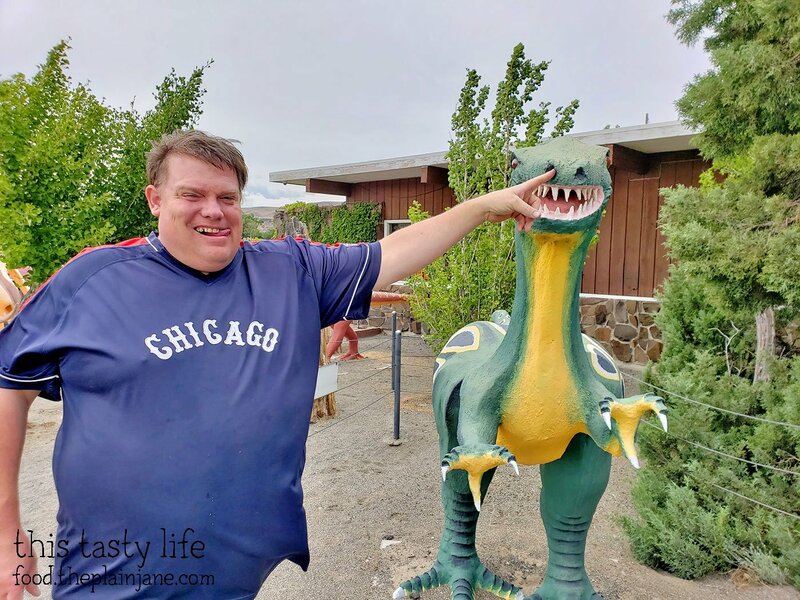 What an epic post – I always enjoy reading your travel posts Mary and seeing the cool road stops/eateries that you go to. Did you like those Mozzarella and marina chips? It tasted like fried mozzarella sticks to me, ha ha. Bert liked it more though. 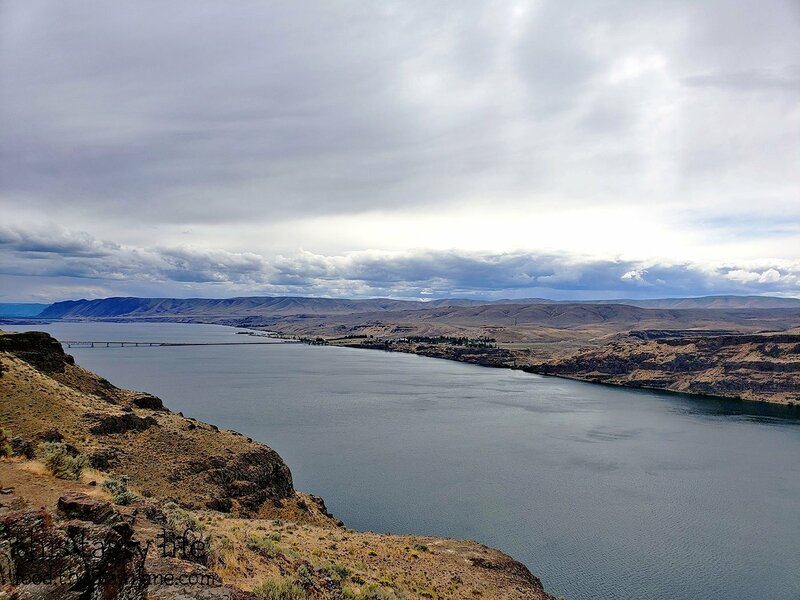 Cool pix of the scenery (bridges, Columbia River, petrified forest, etc). 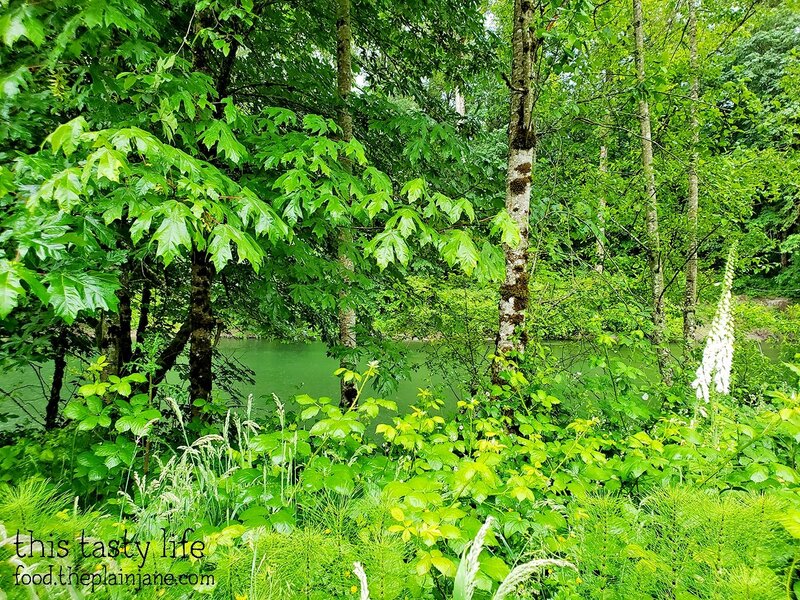 Looks so lush and green over there. One of these days, Bert, TC and I need to check out Spokane and do a road trip to Seattle. It’s been awhile since we were last in Seattle. Looking forward to your Seattle posts! Hi CC! The mozzarella and marina chips were really interesting. I didn’t love them but I didn’t hate them either. But I don’t think I’d really crave to eat them again. 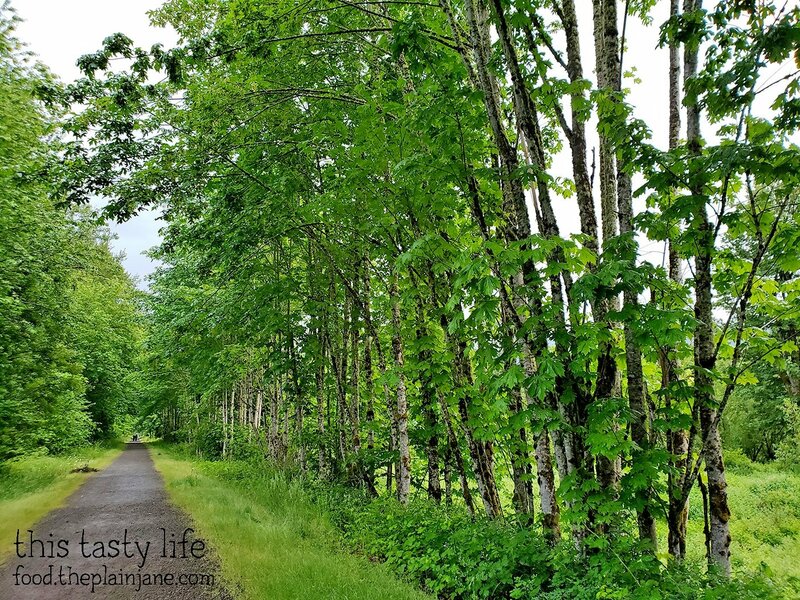 It is so lush and green and pretty in Washington! 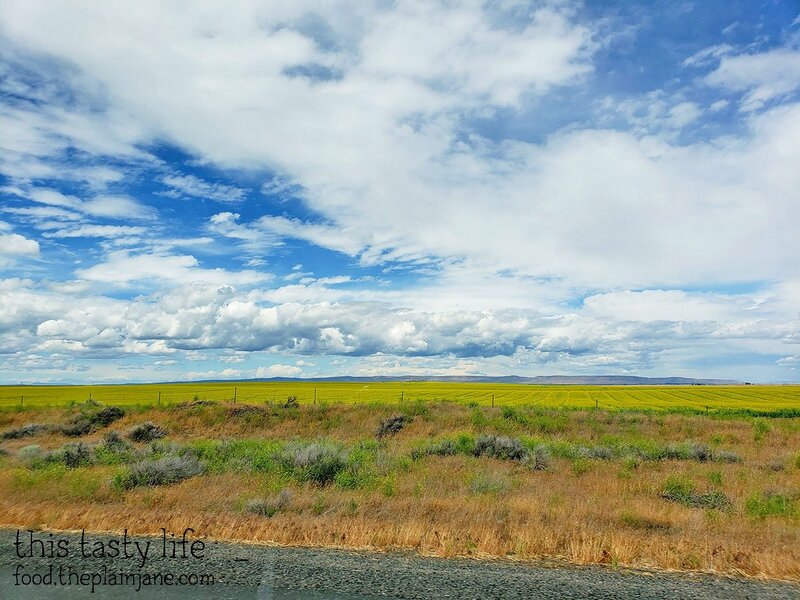 I liked seeing how the landscape changed as we drove across the state, it was a lot of fun.